On November 19, the New York Violoncello Society presented a tribute to Leonard Rose on the occasion of the 100th Anniversary of his birth in 1918. Since Leonard Rose played such a pivotal part in my evolution as a cellist I felt it absolutely essential to be there to celebrate his life and to share my impressions of him as a human being as well as the iconic cellist of all time. To say that his playing inspired me would be the understatement of the century. I used to listen to his recordings of Schelomo and Saint Saens Concerto with the New York Philharmonic by the hour before I had any important solo or concert to play. Somehow, I felt getting his sound in my ear empowered my own sound. It has been said the best teacher is a good example, and in the history of cello playing there has been no more beautiful sound ever produced on a string instrument than Leonard Rose’s cello sound. Although I cannot claim to have even come close I can definitely say I came a lot closer because I had seen the light and moved towards it. Being the light was not my destiny, that was Leonard Rose’s destiny. At this event many people spoke and what emerged was a pure distillation of the warmth and generosity of a great artist and a great human being, and I will always be grateful that I made the effort to be there. There were three times in my life where Leonard Rose’s encouragement meant everything to me. The first was when I asked him for an autographed picture, which I am attaching right now. While I don’t feel that I was worthy of his beautiful inscription at that time I hope he would have felt that I justified it over the course of my cellistic life. The second occurred when I did the first national broadcast of Swan Lake on Live from Lincoln Center. 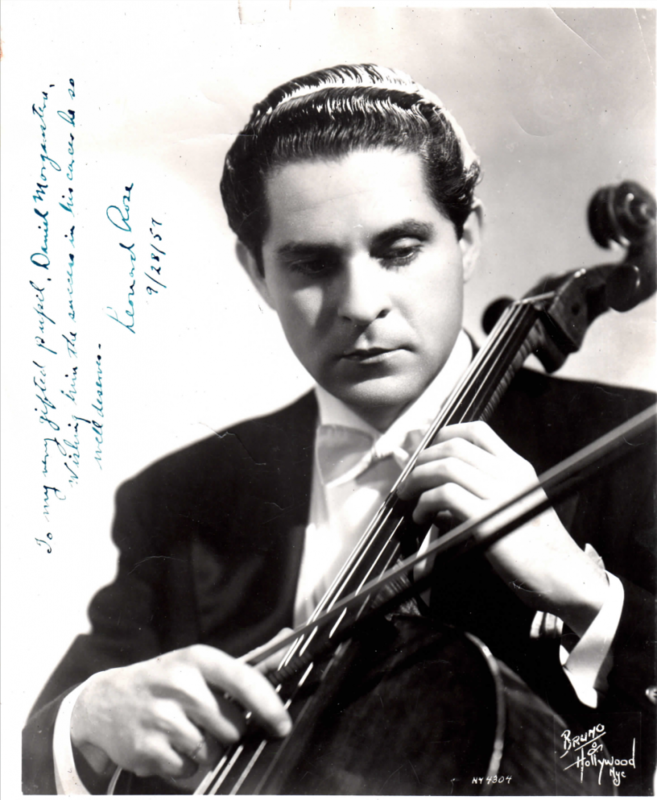 Fred Zlotkin was and still is the principal cellist of the New York City Ballet and Leonard Rose thought that Fred played the solo, and told him that it was wonderful. Fred told me this and I said “That’s the first compliment I’ve gotten from Leonard Rose in 20 years.” This performance also significantly altered Leonard Rose’s relationship to me. I’m not sure that if he knew it was me playing the solo he would have heard it the same way, since he was so fond of Fred. Anyway, 7 years later it led to the third significant moment in my relationship with Leonard Rose. I was on the phone with him talking about vacancies in my American Ballet Theatre cello section. He recommended two cellists who were not only fantastic but became my life long friends. The first was Eric Bartlett, who shared the podium with me at this event, and Scott Balantyne. Towards the end of this conversation Mr. Rose asked me whether I would do him the favor of sending him an autographed picture for his studio. For me, that was practically the best moment of my life. Although I have my own way of organizing a phrase of music, every phrase that I make is imbued with the vision of Leonard Rose’s gestalt: perfect intonation, beautiful sound, and elegant phrasing. To say that Leonard Rose both as a human being and as an artist was one of the great blessings of my life would be an understatement.